In this article, I am going to dive into the secret weapon that is really going to empower you to bend time as you know, and even reinvent your reality. The pineal gland, that little grayish, reddish gland within the human brain. Well, as I’ve touched upon before in other levels, it literally has the power to enable you to break out of this reality and achieve super human feats within any aspects of your life. Your body, career, health, or relationships. It doesn’t matter because it’s so powerful. If you want more wealth, you can use the pineal gland to do it. If you want a better relationship you can use the pineal gland to do it. Rene Descartes was onto the pineal gland and called in the principal seat of the soul and believed that it was the point of connection between the intellect and the body. This is most likely the key to tapping into your higher self and the universe. There are some rather fascinating overlapping facts that surround this little gland. As it turns out, the pineal gland appears in the human embryo at forty nine days of gestation. Forty nine days is also the time that the Tibetans believe it takes for one soul to reincarnate onto the next. Embryos differentiation into male and female also occurs at the forty nine day mark. Now, that’s some seriously interesting similarities right there, right? 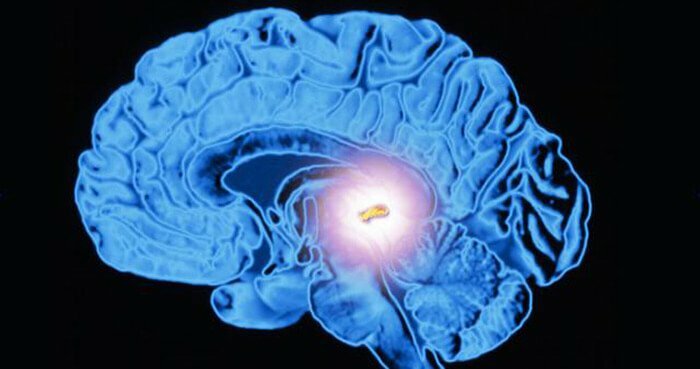 Most importantly, the pineal gland is the part of your brain that allows you to connect to a higher state of consciousness. It does this through the production and secretion of a compound called dimethlytryptamine, or DMT for short. DMT is like a chemical cousin of serotonin and a profound hallucinogen. There are a few ways that your pineal gland is triggered to secrete DMT. One of these is when it’s under extreme duress or stress. Although it’s usually well-guarded from stress, you can stress it out. One of the most stressful times we can experience is death, or a near death experience. When someone is close to death, the last thing they are aware of is this huge release of DMT in their body. A release of DMT can lead to experience of separation between your body and your consciousness. Basically, an out of body experience and act as a catalyst for near death experiences. In essence, DMT induces the machinery of the afterlife to literally spring into motion. Dr. Rich Strassman, who studied the effects of DMT for over twenty years refers to DMT is the God molecule, or the spirit molecule, as a result of his test subjects claiming they had been in contact with non-human or God-like beings under the compounds influence. The hallucinogenic state that DMT triggers that is basically what happens when you’re dreaming is a temporary disconnection from the physical body that allows you to traverse higher realms. In this state, you’re no longer bound by restrictions of time or conventional laws of physics. Professor Alan Watts, a philosopher and expert in comparative religion, described the effects of DMT as load universe into cannon, aim at brain, fire. Your pineal gland acts as a virtual door or portal to directly connect you to the universe and cosmic consciousness. While in this state, your spirit can then use this gateway to connect with the universe and create what you want, or make something a reality. Think about that example from the Matrix, where she needed to learn how to fly a helicopter and she downloaded this information from the software and she instantly knew how to fly a helicopter. Well, it’s the same exact way on how you can download this information from the universe. Anyone can do it and through deep meditation and through deep exercise, focusing on the pineal gland and doing a lot of the death meditations that we’ve talked about. Really tapping into letting go of your ego and just letting it flow through you, you too can be able to download information from the universe. Practicing viragia is very, important. The combination of viragia and an exercise through some breathing techniques will allow you to tap into this information. It takes practice. Some will be quicker than others, some will be longer than others. Again, don’t worry about time. Just practice and it will come to you. When your pineal gland is activated, it transmits a glow of light energy. There’s even a mention of the pineal gland in the bible. 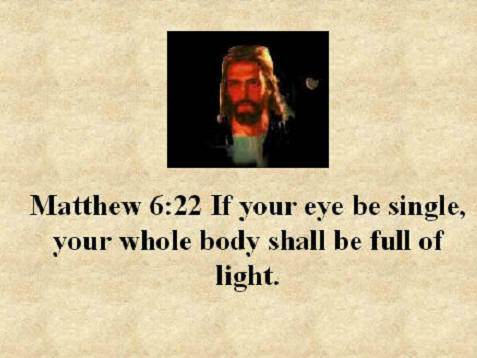 In Matthew six twenty two it says, the light of the body is the eye. If therefore thine eye be single, thy whole body shall be full of light. Think about that for a second. If your body, if that eye, is full of light then your whole body shall be full of light. How do you keep your body full of light and your pineal gland in tip top shape to continue to connect to higher consciousness and project your new reality? However, it’s not unusual due to a less than optimal diet, bad sleep habits, and lack of exercise, that your pineal gland may become atrophied, calcified, and not running on all cylinders, so to speak. This breakdown of you pineal gland can happen a handful of ways. One, regularly consuming heavily refined or processed foods and carbonated drinks. Two, exposing yourself to the toxic chemical fluoride in your water and toothpaste. Three, even a lack of natural sunlight can be to blame. The good news is, all is not lost. Here are a few integral things you can do to activate and awaken your pineal gland. Eliminate processed and refined foods from your diet and decrease your refined sugar intake. Increase your intake of fresh, organic fruits and vegetables and alkaline foods like nuts, seeds, and whole grains. Eating raw cacao or even dark chocolate helps. Using fluoride free toothpaste and drinking non fluoridated water. Adrenaline and cortisol deplete the melatonin and serotonin, the cousins of DMT, within your body. Also, you want to get more sleep. Not just regular sleep. You want to get sleep in darkness. You’ll produce more melatonin sleeping in complete darkness. Melatonin, in turn, awakens your pineal gland. Lastly, and more importantly, exercise your pineal gland. Just like your body and your brain, your pineal gland also needs to be worked out, so to speak. The exercise I’m talking about is both physical and mental. Physical exercise like practicing yoga, particularly inversions when you’re upside down, are particularly helpful because they increase blood flow to your pineal gland. However, beyond yoga the best way to exercise your pineal gland is by meditating and using the sacred symbol like the shri yantra to focus your intent. Meditating on the intricate geometric work of the shri yantra for prolonged periods of time literally alters the shape of your brain and increase alpha brain wave activity. When you access a deeper state of consciousness and allow your brain to enter the alpha brainwave state, you can really tap into your inner powers, or your siddhis. 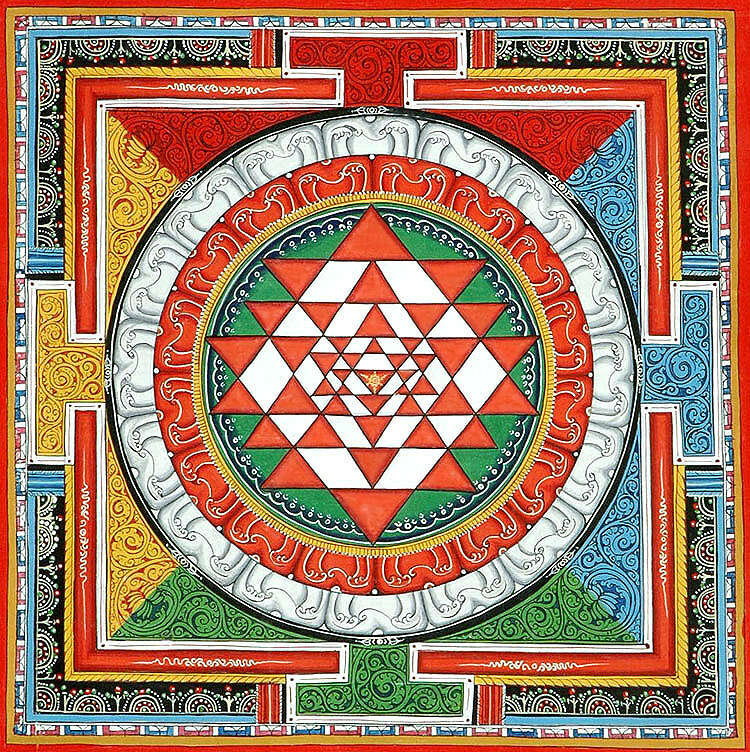 Just as the pineal gland is considered the creation gland, and the gateway to create what you want, so is the central bindu of the shri yantra. They say when you say see the bindu split into three you are in pure creation mode, meaning your pineal gland is receptive to being used to create your reality and secrete the hormones you need to make that happen.